The Satechi USB-C Mobile Pro Hub adds some beneficial ports to the latest iPad Pros, but can cause more frustration if you've got new Mac hardware and have already adapted to USB-C than it may solve. Apple launched the latest round of iPad Pros in the latter half of 2018, with a shiny new USB 3.1 type C port in tow amongst a litany of other welcomed changes. 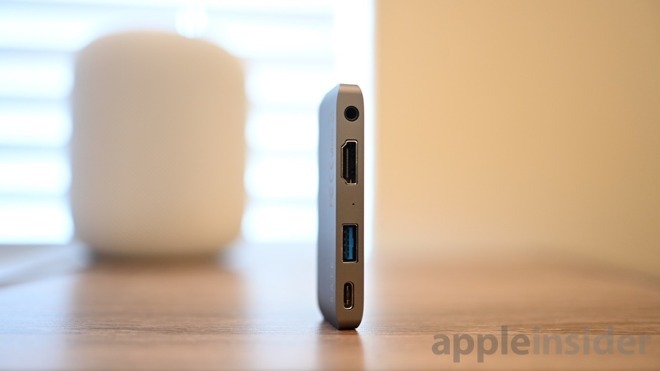 By utilizing USB-C instead of the previously ubiquitous Lightning port, it allowed many accessories to interface directly with iPad, no adapter or specialty cable necessary. This means USB-C cameras like the latest Nikon Z7 and Z6 are able to directly plug in. Same with USB-C microphones, keyboards, and hubs. Many hubs that have been on the market for years already work with the new iPad Pros, bringing HDMI, SD card readers, and USB-A ports to Apple's tablets. These existing hubs, however, were designed for Macs, and fit a Mac's shape. They never had the iPad in mind. If your hub you've already got works, perfect. You can save yourself some bucks. But, if it doesn't or you'd prefer a more tailored solution, Satechi's has a choice for you. Specifically made for the iPad Pros, the new USB-C Mobile Pro Hub is very small, and easy to tote around. It also doesn't add undue stress from a physical standpoint to the case or USB-C port when installed. Unfortunately, there is no back brace or additional stabilization to the hub, relying on USB-C port friction to stay in place. Right now, with our new-ish iPad Pro, the port still has solid grip but if the new iPads are anything like our MacBook Pro, they may lose their grip over time and may not hold the hub as securely. It comes in either Space Gray or Silver to match either of the finishes on the new tablets. Satechi has always been pretty solid when it comes to matching Apple's anodization and these new hubs are no exception. 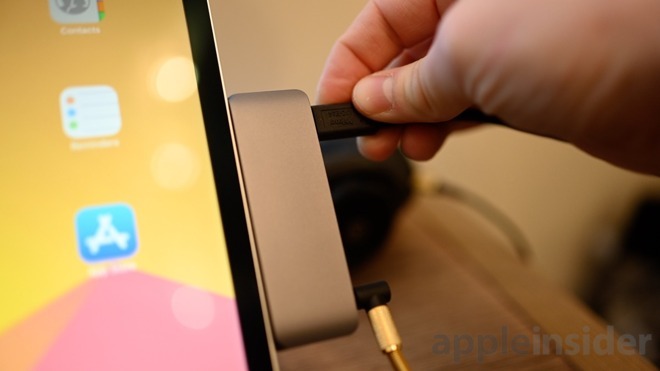 On the hub, there are four ports; 3.5mm audio, HDMI, USB-A, and USB-C. Anyone still utilizing a great pair of traditional wired headphones needs that 3.5mm audio port, especially considering Apple has chosen to not include a USB-C adapter in the box. The HDMI port is crucial for us, especially with the beefed-up external display abilities of the new iPads. Both 2018 iPad Pros can output with a resolution of 4K, and that is exactly what this HDMI port is capable of. We tried some 4K movies and they looked great on our living room TV. We also used an external monitor to try editing some videos in iMovie with the monitor as a preview of our video. Still, we wish more apps and Apple added additional benefits to external displays. USB-A was a bit less useful to us, and is growing less useful by the day, but we did use it with an SD card adapter since one isn't included here, and to connect a microphone, both without issue. The USB-C port on the hub allows you to use all three of the other ports while still charging your iPad at the same time. It is capable of USB-C Power Delivery 3.0, giving you ample power to keep your tablet kicking. It also works in reverse, allowing you to charge up any of your USB-C gear by leeching off your iPad's battery. There's nothing inherently wrong with the Satechi USB-C Mobile Pro Hub. It does what it does very well and offers a decent menagerie of ports. Our problem is really where we are in the market, bridging between a USB-A and USB-C world. Not even just USB-C to USB-A, but older ports in general. Many monitors still use HDMI, a lot of peripherals still ship with USB-A cables, and many prefer their existing wired headphones. This hub is for those people. For those with plenty of USB-C gear, which anyone with a recent Mac is likely to have, they are in a bit of a tricky spot. Without the hub, their USB-C gear works fine -- though one at a time. Then, with the hub, all of those become useless and now need USB-A adapters to actually work. 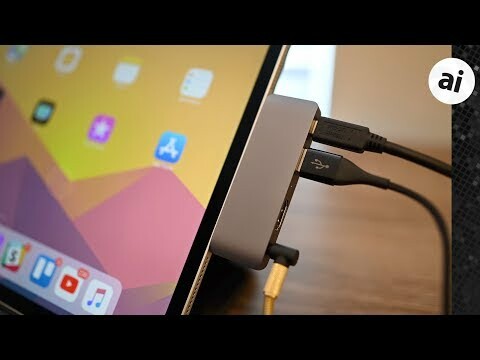 As more and more people add USB-C devices to their gear bags, this adapter also makes things more difficult by requiring two different methods of connecting depending on whether or not they are using the adapter. An adapter like this is extremely useful, letting multiple accessories be used in tandem, but it may have been more useful with at least one additional USB-C port added for data usage rather than just charging. 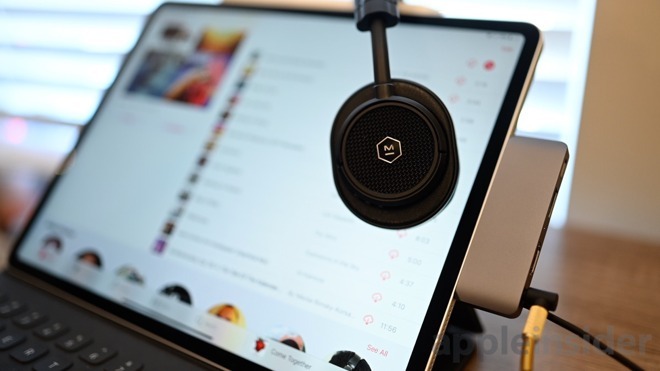 Right now, you can grab the Satechi USB-C Mobile Pro Hub from their website for $59.99 for use with the new iPad Pros or any USB-C equipped Mac. They annoyed the hell out of me. Was on their website. Putting a hub into the shopping basket. Changef my mind and closed the tab. Got an email notification „you forgot something... bla“. Ignored it. Got another mail. Went to the damn site and emptied the basket. Yet another email if i wanted something else. and another informing me the item i had in my basket was really great bla... until i went to their f**** sire and disbled every notification. This article makes a good point about USB-C port connectors loosening up over time. We have a number of current MBP's at work, all of which I set up and maintain. Some initially take ordinary insertion force at the USB-C port, others have been kind of high effort. But over time they all loosen up to varying degrees. The much-used left side ports on my own 2016 TB MBP are much looser now, not enough to cause any problem with cables, but loose enough that I would not rely on them to support a directly attached hub. That situation would be worse with the new iPad Pro, where you'd be relying on a single USB-C port to mechanically support the dock. I'd contrast this with Apple's proprietary Lightning connector design, which retains its mechanical integrity through years of daily cable insertion for charge/sync. I will say that I really like the Satechi dongle/accessories in general. You can avoid their web commerce idiosyncrasies (see previous post) by buying them on Amazon. I have a j5create that I bought at Best Buy back when I bought my ‘16 12” MacBook that works fine with my iPad Pro. It has USB-C power delivery, and a USB-A 3.0 port. I just tried it with an old USB SD card reader, and it works fine. It’s also charging a phone with the USB-A port. I think I paid $25 for it. I’ve been looking at, and have bought two different USB C hubs for this year’s iPad Pro 12.9”. None of them have a USB C port that can be used for anything other than charging. I don’t know if that is part of the usb spec, if other types of ports are on the hub, because I’ve never bought one until now. I’ve also been looking for one with a DVI output, but then one I bought that showed one in the pictures, actually has a VGI port instead. one hub I bought has a 5” cable to the USB C port, and the other plugs directly in, as does the Satechi. I don’t trust the direct plug in type. The article just mentions it getting looser over time. The much bigger problem is torque. 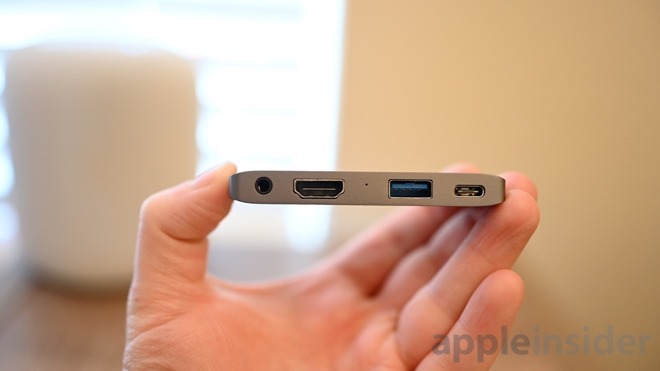 The USB C port is always close to the top end on these devices. If you have something plugged into any of the ports on the device, and mistakenly give a fair tug, you could twist the USB C plug right off the hub. Worse, you can destroy the port on the computer. If you pull straight up on a port opposite the plug, the plug can bend, or break off at a 90 degree angle. If you have something plugged in near the end, the entire thing will twist and bend up. these things are very dangerous! I know they look neat, but with no supports to prevent this bending and twisting, I don’t think they’re worth it. I have a short USB C cable with a female end for hubs, in case they don’t have their own.